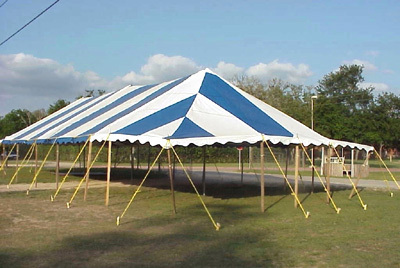 When hosting a big "sit-down" event or meeting, this is the perfect tent for those who will gather. Its frame is constructed with heavy-duty anodized aluminum tubing and welded steel fittings, while the top is made with block-out vinyl to protect from the sun and weather conditions. Wear points are reinforced and buckles and straps are sewn-in. The packaged tent include the tent top with guy ropes attached, galvanized side poles, lightweight center poles, quarter poles, tent stakes, storage bag for easy transportation and storage and an installation video. As with all Premier tents, this 30-ft. by 90-ft. model is available in solid white or white with red, blue, green, or yellow horizontal stripes.